The origin of Kenneth Hagin Ministries’ Campmeeting can be traced back to January 1973. The Lord awakened Rev. Kenneth E. Hagin early one morning and instructed him to hold a special meeting in the spirit of old-time camp meetings. The first gatherings were called Faith Seminar and Indoor Campmeeting. The event is now simply called Campmeeting. Enjoy insightful, inspirational teaching from the Word of God as shared by Campmeeting speakers over the years. 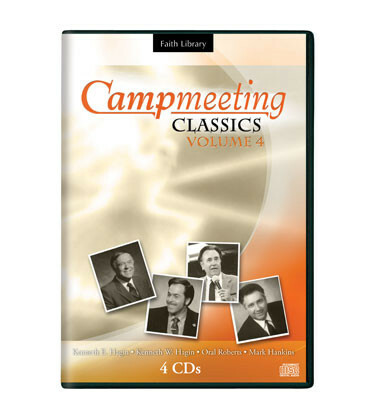 This 4-CD set includes powerful messages from Kenneth E. Hagin, Kenneth W. Hagin, Oral Roberts, and Mark Hankins.